Two plump, plush poppy seed buns surround the dog, with a zig-zag of yellow mustard along the back. Matching Ketchup Hot Dog costume version available. Your dog will look scrumptious "smothered" with mustard and placed between two sesame seed buns. Yummy enough to cuddle with! 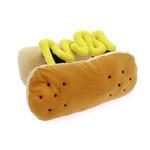 Your little hot dog will be the life of the party in this fun dog costume! 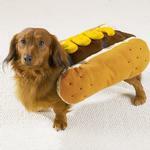 Dogs that secretly want to be weiner dogs can try it out for the day with this novel costume for pets. But of course, this is the ideal costume for Daschunds as well! This hot dog costume is easy to wear since it features elastic straps with quick touch fastener to give your pet a perfect fit. The plush mustard is suspended between the elastic straps for an open and airy feel so your dog doesn't become a hot dog in real life. Great for Halloween parties, Oktoberfest, summer BBQs, or any dog-gone time! Look for our matching Ketchup version for a fun photo shoot and lots of smiles at events. Don't forget to submit your photos below for a chance for your dog to be selected as Pet of the Day. Your pet could win a $250 BaxterBoo.com shopping spree too! See photo contest rules for details. Hot Dog with Mustard Dog Halloween Costume Customer Photos - Send us your photo! They are arguing over who gets to be mustard and who gets to be catsup. Gus has a lot of energy and personality! This is him in his very first wiener dog race. We look toward to entering him in many more. He stopped and modeled for a picture after a long a tiring day. Nathan is a dachshund who loves to eat, sleep, and go on occasional walks around his neighborhood. He also enjoys burrowing under blankets and spending time with his two older dog sisters Sandy and Ginger. Nathan is very excited to show off his costume this year as a halloweenie hot dog with mustard. Posted On 10/19/16 by Valerie G from Albuquerque, NM Yes, Valerie G recommends this product! Penny is a rescued dog and was homeless for months after being kicked out into the streets by previous owner. She loves going to work with me three days a week BUT will not leave the house if she doesn't have an outfit on. She has become quite the fashionista and struts around the company showing off her outfits. Bought the Hot Dog with Mustard costume for Halloween and I'm hoping she will love it as she does her "working" clothes. Oh, by the way, Penny is a dachshund/wire-haired terrier mix with mostly dachshund characteristics so the outfit seems a no brainer!! Posted On 11/02/14 by Michael G from Salem, NH Yes, Michael G recommends this product! Well, he wore it for Halloween, and was a great hit. I will send you a photo as soon as I ge your e-mail address. Everyone loved it. Posted On 10/29/14 by Michael G from Salem , NH Yes, Michael G recommends this product! Max will wear the most original costume for Halloween in his neighborhood. The price was right, the look is terrific, and he loves it. Posted On 10/29/14 by Selene S from Van Nuys, CA Yes, Selene S recommends this product! Soooo cute! Except my dogs think it's a toy. This costume is durable, nicely fitted, easy to get on/off & comical on my girls. Highly recommend - especially if you're in a pickle!